In 2017 Oral-B launched the Pro 2 2000 (view on Amazon) and the Pro 2 2500 (view on Amazon). These are replacements to the Pro 2000 and the Pro 2500 being reviewed here, note the extra ‘2’ in the product name for the newer models. Amazon’s links for the older models now redirect straight to the newer models. We have compared the new models in our Oral-B Pro 2 2000 vs Pro 2 2500 post. The primary difference, is the new 2017 models come with a Li-Ion battery compared to the NiMH battery in the brushes we compare here. This doubles the battery life.We wish to make you aware of the different models to ensure you make the right comparison and are getting the brush best suited to you and your needs. These two brushes are right next to each other in the Oral-B range, so they are very similar. From a technical point of view, there is no difference between them, so which one should you choose? We take a detailed look below in our Oral-B Pro 2000 vs 2500 comparison. With only colour and box contents to chose between the two, the Pro 2000 is our choice, unless you really like the Black and White colour combination or are a frequent overnight traveller whereby a travel case to store your brush would be really useful, in which case go for the Pro 2500. The Pro 2500 comes with Black rubber whilst the Pro 200 is available in Blue or Pink. The Pro 2500 comes with a travel case in the box whereas the Pro 2000 does not. The Pro 2500 Black is generally the more expensive, but buy at the right time and there is not price difference. Detailed Comparison: What’s the difference between the Oral-B Pro 2000 and Pro 2500 Black? The fact that there are so few difference between these two brushes makes this a very simple comparison, but in some respects a more difficult comparison as there are so few things to discuss and really determine which is better. Ultimately the decision is personal opinion and what suits me may not be best suited to you. The most obvious difference is the colour. Running down the front of the Pro 2500 is a piece of black rubber to act as a grip whereas the Pro 2000 is finished in a light blue or often a pink colour. The black rubber is actually part of a more premium/limited edition range if you like. Not all models in the Oral-B range are available with black rubber and those that are tend to be given there own new model name. There is not a Pro 2500 that is not available in black, so this is why the Pro 2500 is often referred to as the 2500 Black. I like the black and white, it is a classic colour combination that well, just works. Aside from this the Pro 2500 comes with a hard plastic travel case in the box which the Pro 200 does not. The travel case holds the brush handle and up to 2 brush heads. This is great for protecting it if you travel frequently. If however you are not away for overnight periods all that often it might not be worth the investment, because the 2500 is fractionally more expensive for the limited edition colour and the travel case. The actual cost difference is not all that great. The Pro 2500 Black has a recommended retail price of £69.99 but is generally available from £35-£45 which works out at about around 7p per day to own over 3 years including replacement brush heads and just one user. The Pro 2000 on the other hand is available for £30 now which works out at about 6p per day to own. To be fair the online prices are always changing and it is not impossible to actually pick up the Pro 2500 Black for the same price as the 2000, which would actually make it the better buy as you get the travel case included. With the key differences covered, it is worth looking at many of the similarities between the two and understanding just what benefits such toothbrushes bring, particularly over a manual. 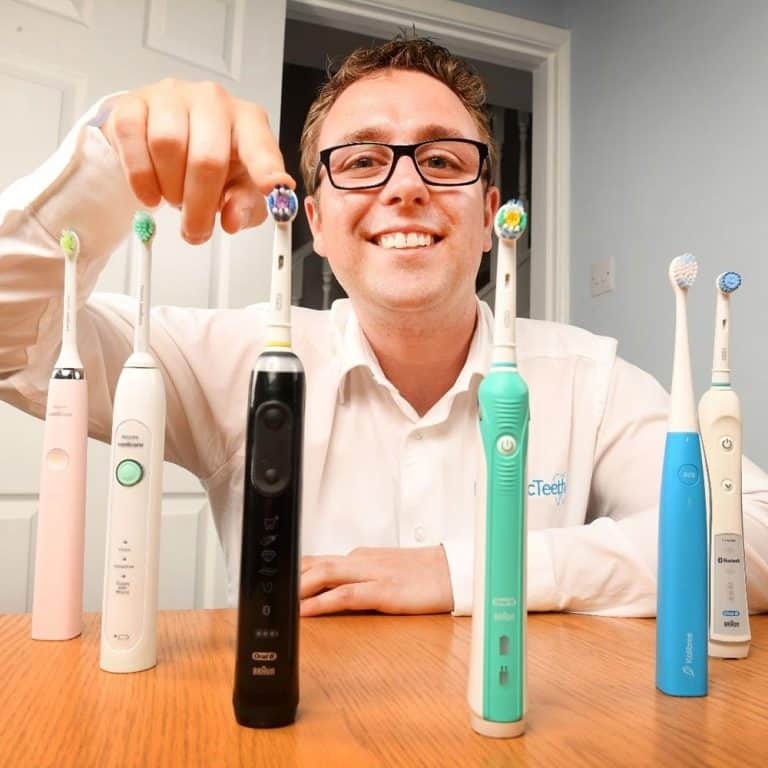 Oral-B are one of the biggest brands and tend to work out more cost effective than many competing brands when you consider features and quality. Both of the brushes come with a standard 2 year manufacturers warranty, but if you register the brush online you get an extra year at no cost. This covers internal hardware and part failure and does not cover user damage. In the box, both come with a basic but functional charging stand. The charging stand that has a 2 pin connector that attaches to a shaver socket in a bathroom. If you do not have one, you can purchase an adapter to allow you to connect it to a conventional 3 pin UK mains socket. As a toothbrush is all about cleaning the teeth, this is a job that both models do well. Dentists recommend a 2 minute cleaning cycle twice a day to maintain healthy teeth. Always try to leave 45-60 minutes after eating or drinking anything other than water before cleaning your teeth, if anything brush before eating. As the 2500 is essentially an upgrade on the 2000, both share the same cleaning mode and both have 2 modes. Daily Clean is the standard mode on any Oral-B brush this formed through 8,800 oscillations and 40,000 pulsations. The Gum Care or Massage mode as it is often known drops this down to 2,600-8,800 oscillations and 12,000-40,000 pulsations. Power delivery from the electric motor is consistent and this is why an electric toothbrush will normally clean better than a manual brush. You will often see claims of up to 100% more plaque removal and this is why. That said, even if you are not ready for an electric brush and want to stick to manual, do look at your technique. Click here to see our detailed guide on how to clean your teeth correctly. If you follow this, your dentist is more likely to praise you about the cleanliness of your teeth. Each brush head has advantages and disadvantages and are engineered to work better with certain cleaning modes (many of which are not available on the 2000 series). You can find a detailed comparison of all the brush heads here or the following table summaries each. On the upper rear of both brushes is the Pressure Sensor. When either the 2000 or 2500 is in use, if too much pressure is applied when cleaning the teeth, an LED behind the red plastic lights up and gives a visual indication to your or I using the brush that we are brushing too hard. No there is no difference. Technically they are the same from the perspective of cleaning abilities so to claim one cleans better than the other is unjustified. With the right technique and regular cleaning you will leave your teeth feeling and looking healthier, but if you are using the Pro 2000 or 2500 on the daily clean or gum care mode, there is no known difference in their actual results. Generally speaking, the Pro 2000 is the cheaper of the two. At the time of writing the Pro 2000 is available from £30* and the Pro 2500 £35*. This makes the 2000 around 6p per per day and the 2500 7p. With very competitive prices online it is possible to get the 2500 for the same price as the 2000 making it the more cost effective option in this instance. For the frequent overnight traveler or those who are a fan of the Black and White colour combination, the Pro 2500 is the obvious choice for you. For everyone else go for the 2000. It’s cheaper with the same features. However, if you are buying when there are deals on, you may get the Pro 2500 Black for the same price, which essentially means a free travel case included. if I understand well the only difference between the 2000 and 2500 models is that with the 2500 got a travel box and with 2000 the box did not get. Yes, the main difference is the Pro 2500 comes with a travel case and the 2000 does not. Muchas gracias, me ha resultado muy instructivo y me ha ayudado a tomar una decisión final sensata. Thank you very much, it has been very instructive and has helped me make a wise final decision. No hay problema, me alegro de poder ayudar. I would just like to say thank you to ElecticTeeth. The no nonsense reviews and honest opinion reports have helped make choosing a product a lot easier. It’s great to find a straight talking down to earth review and comparison site. Thank you. Thanks Bobby, so glad we could be of assistance. What have you decided to go for? The 2500 has a timer, which switches the toothbrush off after 2 minutes. Hi. Is this so? Can you point us to information that confirms this? Is there any difference in POWER/SPEED viz max rotation, oscillations per minute etc, between the Pro 650 and the Pro 2500 please?